Charcoal is a natural material, usually wood, that has been burned into a dark, soft material. Charcoal is bolld and expressive.The advantage of using charcoal is that is quickly laid and easily blended. The disadvatage is the mess. Caution must be used to not smear the art and to preserve the drawing once it is complete. Charcoal techniques are similar to pencil techniques, but you may struggle to get the range of values available in pencil. Burned willow vines, charcoal pencils and compressed sticks are the most common forms of charcoal. 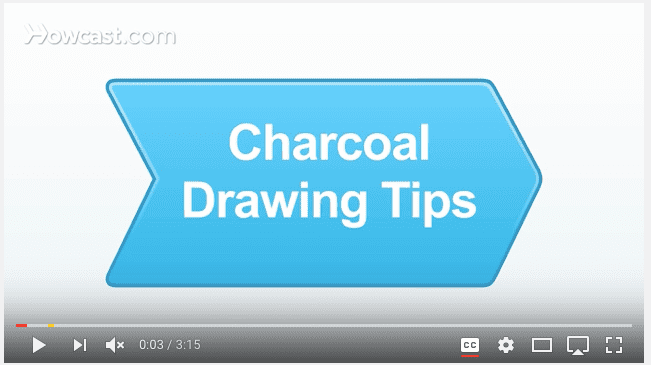 White charcoal is used to add highlights to charcoal drawings or alone on dark paper. Erase out or leave the area to be covered with the white charcoal empty. When you layer white charcoal over black it appears dirty and no longer white. The best types of papers to use with charcoal are those that have "tooth" or texture rather than smooth paper. Charcoal can be used on diffeerent colors as well. Many artist use tan or grey paper, but there are many other colors. Charcoal drawing is similar to pencil drawing in many ways. You will want to include a wide range of values from highlights to shadows. Other techniques like hatching, cross hatching, and scumbling can also be used. Just remember that the charcoal is much softer and blends (or smears) very easily. Additive Drawing​ - Drawing by adding the shadows leaving the white or highlight areas of the paper. This is typically how we draw with pencil on white paper. Reductive (or Subtractive) Drawing - The paper is toned with a layer of charcoal first. Darks are added and highlights are erased out. Basically you smear the charcoal all over the paper and erase out the lighter areas and highlights. Then you add the darker shadows.